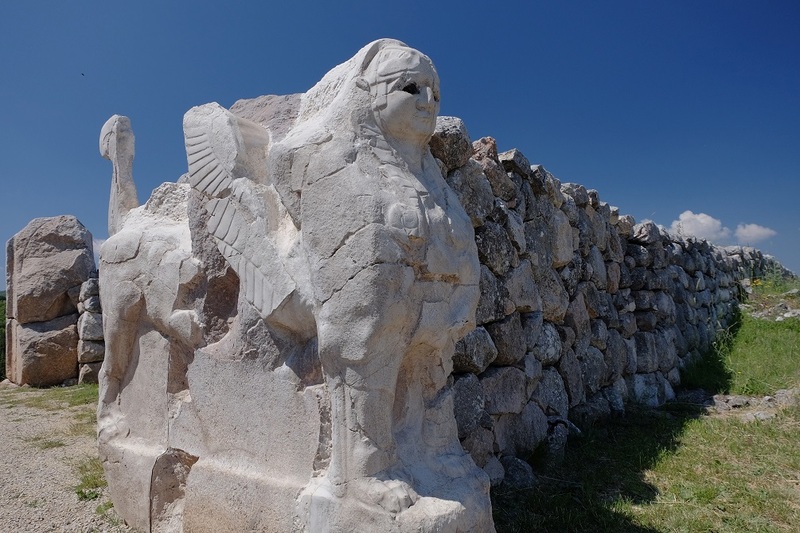 The ancient City of Hattusa is home to megalithic stones, sphinxes, Lions, a mysterious green stone, laser-like drill-holes somehow performed on andesite blocks, and archeological features eerily similar to those found halfway across the world in South America. The magnificent ruins of this once great city lie near the city of Boğazkale, Turkey. It served as a capital city for the Hittite Empire in the late Bronze Age. The city had extensive forests and fertile adjacent fields, although its location had two drawbacks: the rivers in the area were not navigable, which impeded river transport, and the proximity to the barbarous Kaskians. 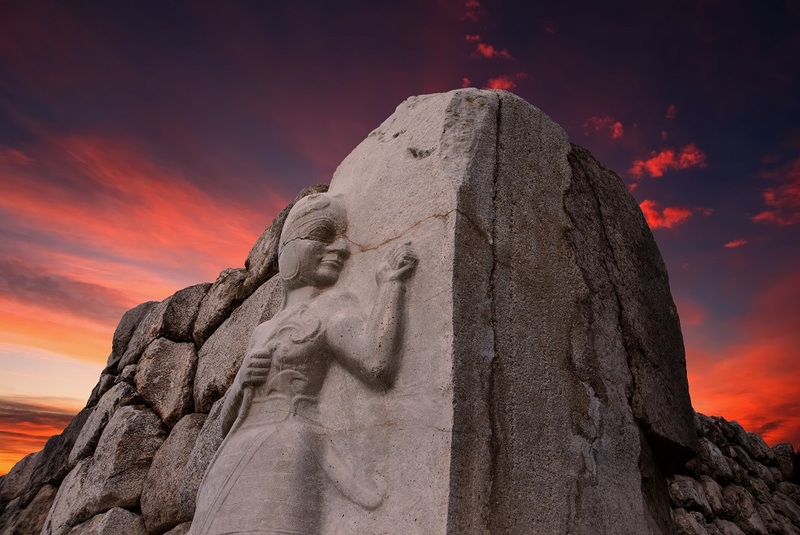 According to historical accounts, the kaskas were a permanent and constant threat to Hattusa. Sunset view of the King gate of Hattusa. Image Credit: Shutterstock. The Hittites occupied the city; a people shrouded in mystery. The Hittite empire was not small; it stretched as far as the Bosphorus and what is today’s Syria. This ancient civilization was a significant super-power of the near East, and their military incursions often provoked other great powers such as the ancient Egyptians. Experts have excavated several ancient texts in Turkey show an intense diplomatic relationship present in distant times between the Egyptians and the Hittites. One of the most important discoveries at the site has been the cuneiform royal archives of clay tablets, known as the Bogazköy Archive. These ancient documents consist of official correspondence and contracts, as well as legal codes. Among them, archaeologists also discovered procedures for a cult ceremony, oracular prophecies and even literature of the ancient Near East. One of the most important ancient tablets discovered on the site, currently on display at the Istanbul Archaeology Museum, details the terms of a peace settlement after the Battle of Kadesh between the Hittites army and the Egyptians ruled under Ramesses II, in 1259 or 1258 BC. Curiously, this happens to be the first peace treaty in History, and a copy is on display in the United Nations in New York City considered an example of the earliest known international peace treaties. The first excavations carried out in the area date back to 1906, when the German Archaeological Institute began to work in the ruins of the city, work that has continued uninterrupted until now in the summer archaeological campaigns. Researchers shave excavated Numerous clay tablets, written in a multitude of languages, such as Luwian or Akkadian, which are the main source for the study of Hittite culture. The remains excavated so far correspond mainly to the reign of the last Hittite monarchs who modified many ancient temples in order to show the splendor of their empire, taking advantage of the prosperity of that time and the empire’s military power. The Sphinx Gate at Hattusa. Image Credit: Shutterstock. This ancient city went through turbulent times. 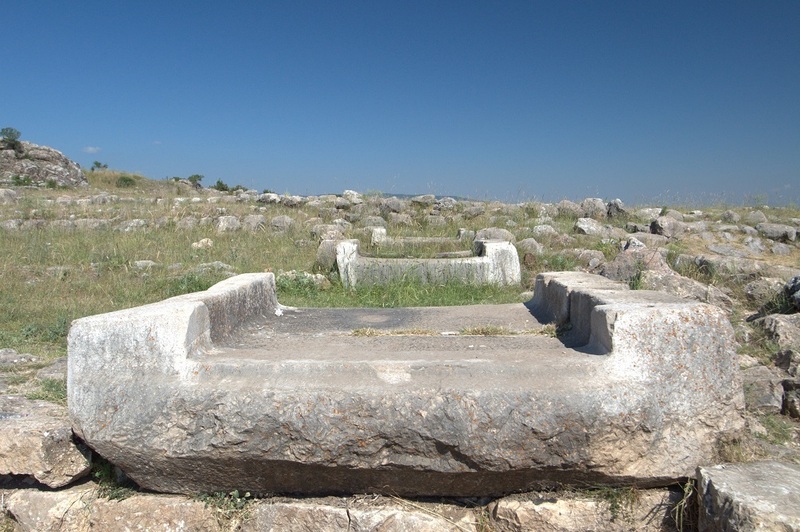 Hattusa was initially founded by a people of non-Indo-European language, Hatti, but during the reign of Anitta (XVIII century BC) it hosted aristocrats rebelling against Anitta and was, therefore, destroyed. Hattusili I reconstructed the city, and it turned it into his capital, to the detriment of Nesa, until the point of which its own name, Hattusili, is related to the name of the city. All Hattusili’s successors retained the capital at Hattusa, except Muwatalli II who moved him to Tarhuntassa to better defend himself against the Egyptians, but the transfer did not last long, as his son Urhi-Tesub moved the capital back to Hattusa. One of the constants of Hittite history is the threat of the Kaskas, who, appearing for the first time in the time of Hantili II, came to capture the capital in the time of Arnuwanda I, the Hittites having to wait until Tudhaliya III to reconquer the city. After the fall of the Hittite Empire (1200 BC, approx.) The track of Hattusa is lost, although it is suspected that the Kaskas or some Phrygian tribe destroyed it. The ruins of the Great Temple of Hattusa. Image Credit: Shutterstock. The end of the Hittite empire came abruptly. After the destruction of Hattusa, the site remained isolated until it was rediscovered in modern-times. Curiously, scholars indicate how around the same time when Hattusa destroyed, other great cities of the Near East also faced annihilation. Experts conclude that a set of massive fires brought the city of Hattusa and other sites in the area to their knees. Great centers were burnt down mysteriously. From cities of Palestine to the fortresses of Syria, and even ancient Egyptian cities of the delta succumbed and were quickly turned to ash. 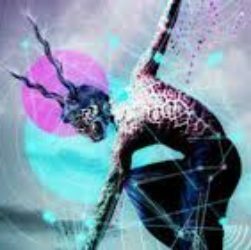 It remains an enigma as to what exactly occurred during that time, and what kind of army had in their possession such advanced weaponry as to bring down powerful cities. Some scholars argue that these cities were not burned down by invading armies but were destroyed by a force, not from Earth. The city of Hattusa was home to formidable walls which were considered among the strongest defensive walls of any bronze age city in the Near East or elsewhere in the ancient world. This has led some exerts to question whether it is possible that the city of Hattusa was destroyed by perhaps a comet, or asteroid impact in the distant past. At its peak, the city of Hattusa was home to around 50,000 inhabitants. 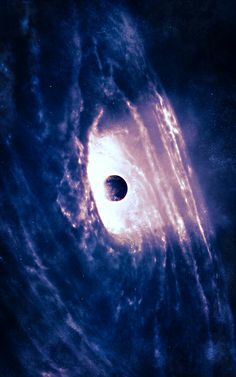 Similar drill holes can be found in South America and Africa. The builders of the ancient city of Hattusa were advanced stonemasons. Evidence of their advanced stone-working skills can be found all over the ruins today. The Great Temple of Hattusa is notable for a distinct megalithic construction. Its base is made out of massive andesite stone. Other elements include large stones ranging between 6 to 8 meters in length, and weighing well over 50 tons. Some authors have mentioned how some elements of the Great Temple of Hattusa are eerily similar to design elements found half-way across the world in Peru, at the Qorikancha temple. 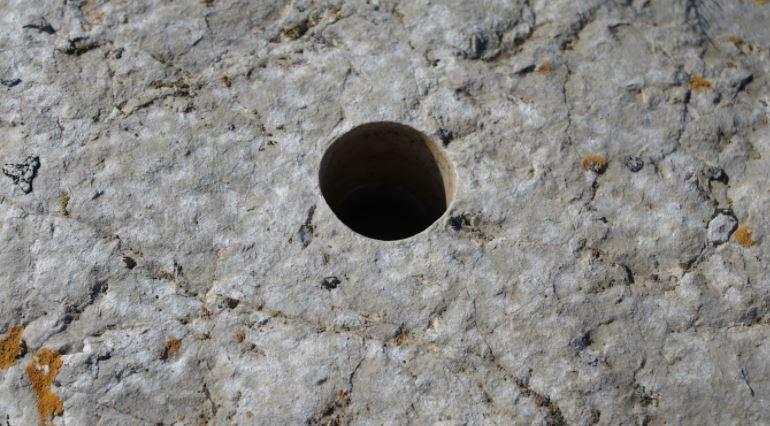 But perhaps the most significant mystery– concerning stone masonry–are the enigmatic drill holes found all over the site. Numerous drill holes–perfectly drilled–have been found across the site. It remains a profound mystery as to how the builders of the city created these nearly perfect holes in andesite stone. Furthermore, there is no conclusive explanation as to what the purpose of the drill holes was. Some boulders found at the site include dozens of drill holes; their purpose remains a mystery. 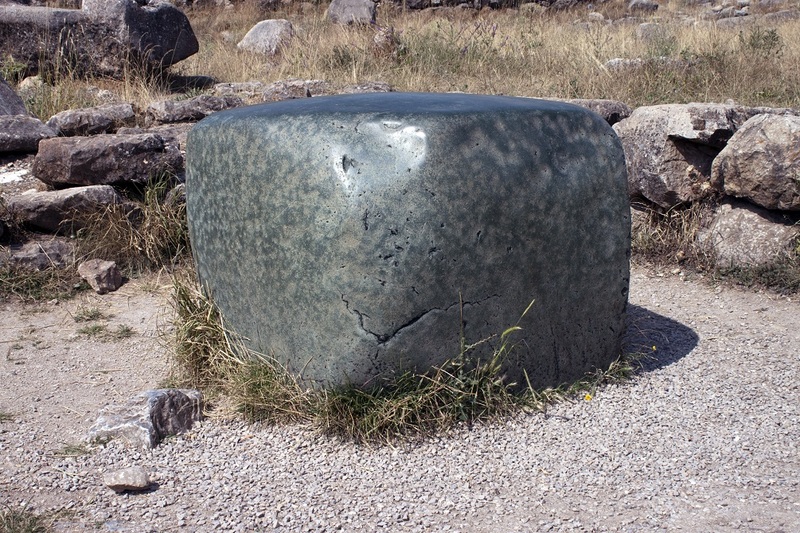 Another great mystery, and perhaps a feature by which Hattusa is best-known is a massive gree-stone boulder, found within the area where the Great Temple once stood. Notice the perfectly polished surface. 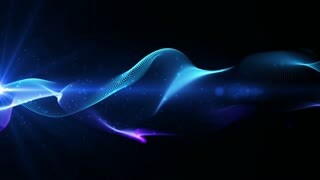 Image Credit: Shutterstock. The enigmatic stone has been the subject f debate among experts who cannot agree on the origins of the stone itself. Some argue that the mysterious boulder was a gift from Ramses II after the peace treaty of Kadesh, however, due to the lack of ancient texts describing it, this theory cannot be proven yet. The Green Stone is perfectly polished to the point it almost acts as a mirror. 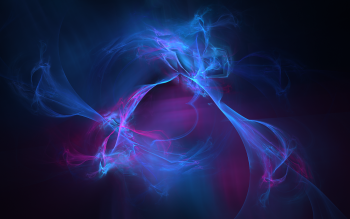 It reflects light, and many people who have touched it say it gives off strange energies. 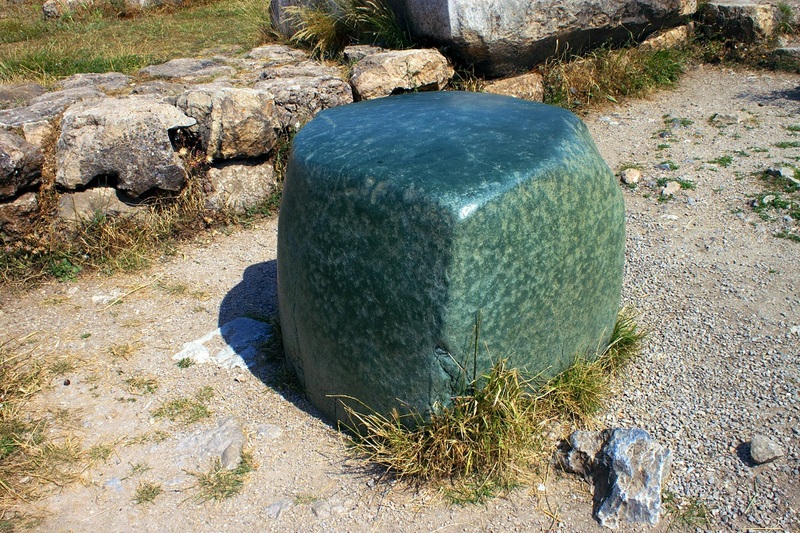 Many argue that because the green stone is found within the premises of the ancient temple, it may have had a religious function.